Do any of you care to stare at the walls of local railway stations? Filled with years of dirt and stains, these are the dark blotches on our great nation. But, if you are at Chennai station, now you have many reasons to stare at the station’s walls and keep looking at them. 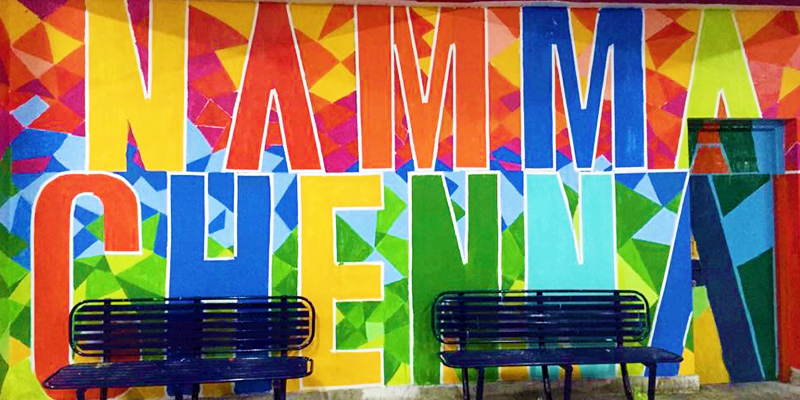 Many volunteer groups have taken up the tough task of beautifying the railway stations of Chennai. 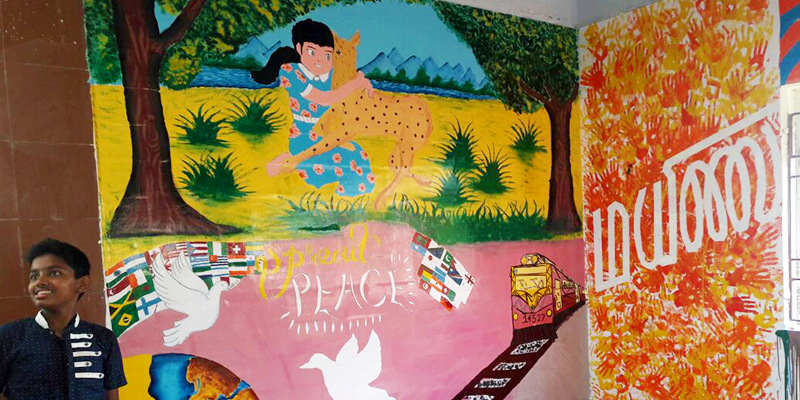 Recently, under an initiative named Chennai Murail 14 railway stations in Chennai were painted with beautiful wall murals. Thiruvanmiyur railway station is the central hub for the entire IT corridor of Chennai and employees of PayPal took it upon themselves to paint their signatures on the walls of a platform. The concepts, inspired by popular comics and typography designs, are very creatively chosen to encourage people to use photo-ops while travelling. Saidapet is a heritage railway station with British era building housing the ticket counters on both entrances. It is also one of the busiest railway stations of Chennai, serving thousands of middle class residents nearby. 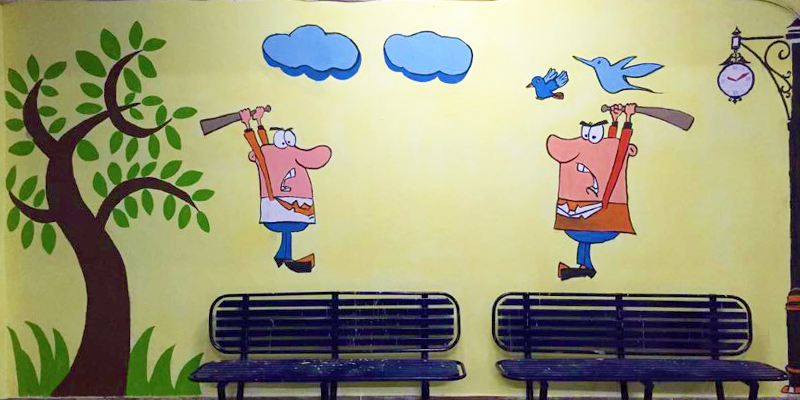 Nalandaway Foundation, an NGO working with Chennai’s children, decided to convert the west entrance building. Their works are a tribute to Tamil cinema and they depict the legends of the industry by portraying some of their iconic movie scenes. Mylapore, popularly referred as the cultural centre of Chennai, is where tourists can experience the typical heritage of Chennai in several aspects of life. So, the students of DAV School decided to add their stamps of colour on the platforms of this station. Their prime themes are Peace and Art. Kotturpuram is an important station in Chennai’s MRTS route. Apart from being a residential area Kotturpuram is also a key base for the tech giants Cognizant. Cognizant went out of their way to take up this station for beautification. 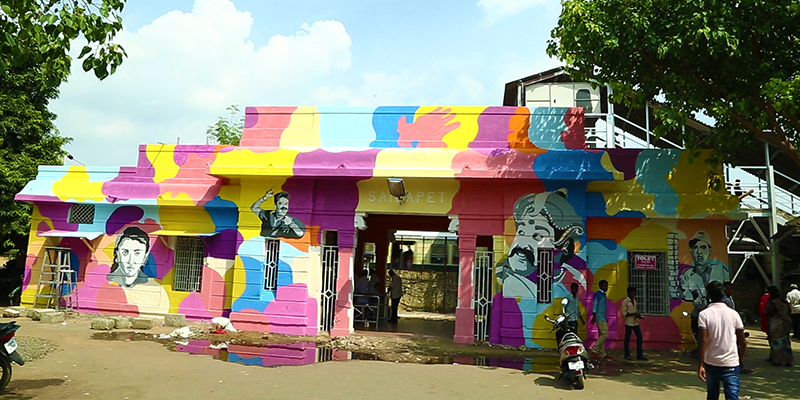 It was fun seeing the Cognizant employees leave their keyboards and take up paint and brush to paint murals with Tamil messages giving a major facelift to this railway station. 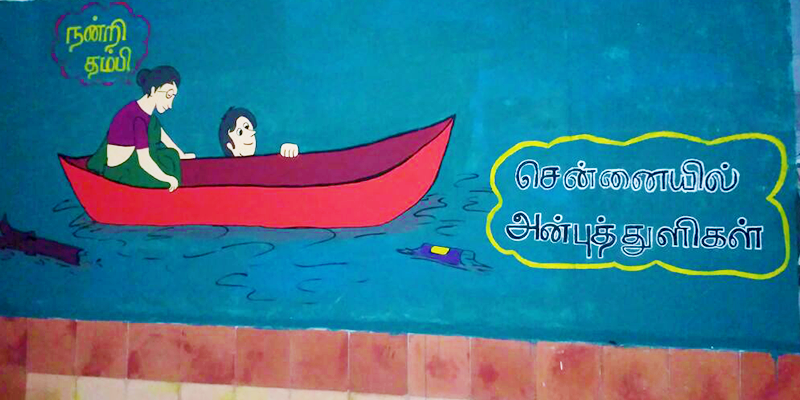 The messages in these murals depict the spirit of Chennaiites during the recent floods. Chennai Beach is the starting point of the Chennai local train network and the largest station in the suburban stretch. KRI Foundation, an NGO, provided Chennai Beach with the look it much deserved. The group beautified an entire platform, using classical art as their way of expression. Kasturba Nagar MRTS station is the connecting hub to several key institutions like the IIT Madras, Anna University and the popular IT corridor of Chennai. 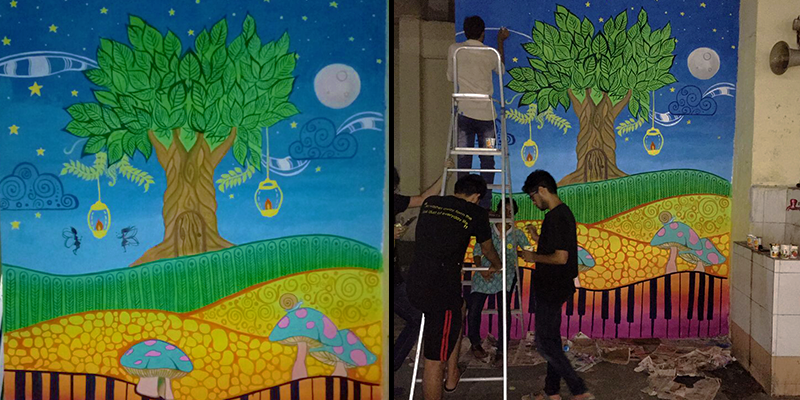 The students of IIT Madras took some time off from their regular studies to transform the walls of Kasturba Nagar MRTS station into beautiful art pieces. They used fantasy art as their inspiration. Aesthetics in public spaces is something new and catching up in India, and Chennai has jumped in to this league. The Chennai Murail initiative will definitely add some colourful relief to the daily commute of millions of Chennaiites. The efforts put in by these volunteer groups are commendable and we wish that they would lead to many other such efforts in other cities as well. After all – cleanliness is godliness!